Welcome to Medicine Park, Oklahoma's first resort town. This earthcache will teach you about the cobblestones that were used to build the walls and cabins in this charming little town. There is no physical cache container to find; to log this earthcache, you will need to email us the answers to the questions below. Handicap and stroller access available from the sidewalk to the south. The questions are repeated in the unencrypted hint for your convenience. Based on current scientific theory, around 550 to 600 million years ago, this entire area was under water after the land collapsed into a basin and was flooded by the sea. The floor of the basin was thickly covered in sediment washed into the sea. Hot lava formed under this sedimentary rock and was forced upward into it. Because the lava was insulated by the layers of rock above it, it cooled slowly, forming the dark, finely grained igneous rock called gabbro. Around 50 million years later, another intrusive sheet of hot granite lava formed under the surface and was forced up through the older gabbro. Although some of the lava reached the surface through vents, much of it cooled below the surface as well, though not as slowly as the gabbro. The granite it formed, called Mount Scott granite, is the most extensively found rock in the Wichita Mountains. Mount Scott is a leucogranite, meaning it is lightly colored and contains few dark specks of materials. The rock mostly consists of quartz and microperthite (an alkali type of feldspar, the rock that makes up over 60% of the earth's crust) and contains low amounts of iron and magnesium. Geologists believe that, around 515 to 425 million years ago, the land subsided or sank under sea water, and the sheet of Mount Scott granite was then buried under sediment. Then, around 300 million years ago, there was a massive uplift, and the land was raised up around 20,000 feet. This produced mountains much larger than you can see today. The limestone that formed from the sediment that covered Mount Scott weathered and eroded away around 250 million years ago, as did some of the granite. These sediments, called the Post Oak Conglomerate, are where cobblestones are found, often surrounded by clay. CHEMICAL WEATHERING is the breaking down of the material forming the rock itself, forming new chemical compounds. Common chemical weathering processes are solution, oxidization, hydrolysis, and hydration. SOLUTION: In this process, also called carbonation, water dissolves the rock itself. As rain falls through the atmosphere, it absorbs carbon dioxide and becomes acidic. Rocks that contain calcite, such as limestone and marble, are soluble in acidic water. The slightly acidic water dissolves the rock, much like dissolving sugar into water. The calcite does not change while it is dissolved; it can later precipitate and reform as a solid; this is how stalactites, stalagmites, and other rock formations are formed in limestone caves. OXIDIZATION: In this process, oxygen combines with metals in the rock, causing them to chemically change and making the rock less resistant to weathering. The most commonly observed example is the oxidization of iron in rocks, giving them a rusty appearance. But other minerals can oxidize as well; for example, rocks containing copper can oxidize to a bright green or blue color. HYDROLYSIS: Water actually separates the chemical bonds of the minerals in the rock, changing its chemical composition, breaking down the crystal structure, and making it less resistant to weathering. Water reacts with rocks containing feldspar, turning it into clay and soluble salts. HYDRATION: Water molecules combine with the molecular structure of the rock, changing it into a different material. Hydration expands volume and also results in rock deformation. When the rock dehydrates or dries out, it decreases in volume. For example, when anhydrite rock comes in contact with water, it combines with water molecules to become gypsum and expands, forming mounds. The town was founded in 1908 as a private health resort by Elmer Thomas, who saw the area's potential for development and began buying property in the area in 1901 along with his business partner, Hal Lloyd. 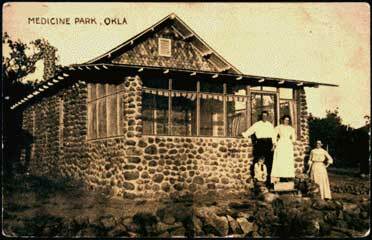 Other companies began purchasing land in 1911, starting with the Oklahoma Press Association, who built a two-story clubhouse using cobblestones and wood (the present-day Plantation Inn was built to recreate this location after the clubhouse burned down in 1940). Cobblestones were the building material of choice in Medicine Park to add to the town's character. Small cobblestone cabins were built throughout the town when private lots were sold in the 1920s. Today, several of these old cobblestone cabins have been restored as shops along Medicine Creek. Although the town is no longer a resort -- the water slide that used to be located near this cache, for one, is long gone -- Medicine Park has kept its charm and keeps drawing visitors year round. To log this earthcache, email us or send us a message (visit link) and copy and paste these questions, along with your answers. Please do not post the answers in your log, even if encrypted. There's no need to wait for confirmation from us before you log, but we will email you back if you include your email address in the message. Group answers are fine; just let us know who was with you. 2. Examine the surface of different cobblestones. Describe the different colors and textures you see. Do you see any cracks or flaking? 3. Based on your reading and observations, what type or types of chemical weathering do you think affected the granite rocks? Why do you think that? Photos of your visit are always appreciated, but please don't post any close-up photos of the rock surface. This earthcache was placed with the permission of the Town of Medicine Park. [To log this earthcache, use the "send message" link in our profile and copy and paste these questions, along with your answers. Please do not post the answers in your log, even if encrypted. There's no need to wait for confirmation from us before you log, but we will email you back if you include your email address in the message. Group answers are fine; just let us know who was with you. 3. Based on your reading and observations, what type or types of chemical weathering do you think affected the granite rocks here? Why do you think that?